If you had to focus on one thing to create, for 100 days straight, what would it be? This year I will join Elle Luna’s #100DayProject, which challenges participants to do just that. Some of you remember my 52 Faces Project last year, which stretched me to practice portraits ( which previously TERRIFIED ME!) and I actually improved with each sketch. I was in awe! Practice does make….well, better. Not perfect, but that is not this gal’s goal anyhow. 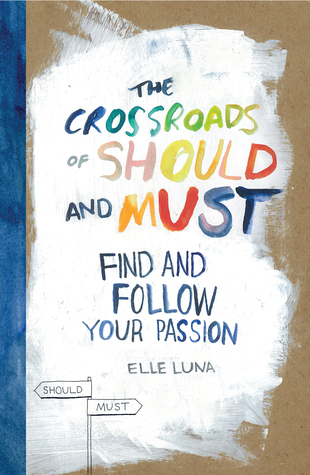 If you haven’t heard of Elle Luna, you should run out and grab her book “The Crossroads Between Should and Must”. A whimsical and innovative creator and connector, her wise words of artsy inspiration are required reading for us creative folk – including those who don’t consider themselves creative, and especially those who haven’t dared to try just yet. Previous Post Following My Blog? Get a Hand-Sketched Postcard! I’m looking forward to seeing them all! It will keep me busy, but I am trying to get them done in the morning before the day gets rolling. Finding a project to structure being creative really helps me. I have to admit, I keep coming back to pottery and think of you. Never got around to it this winter. The pottery will wait for you until you find the time! Due to a little eye injury last autumn I wasn’t able to work with clay and glazes for the biggest part of winter too, which made me really sad. But now I´m back on track and hope to find the time to carry out some of the ideas that have accumulated during that time!